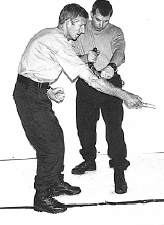 Tactical Safety Baton 45 is a revolutionary new device that will forever change the face of baton usage. Designed for use by law-enforcement, military and corrections officers, the TSB 45 Model TODD 45 provides a high level of defence against both armed and unarmed threats as well as providing sound deterrent and restraint factors. 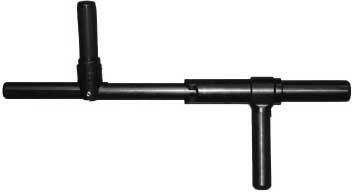 The TSB 45 is a two handled expandible, rotating rear handle device, the baton is made of Tylon High for high impact and high wear applications. TSB 45 weighs a minimal 530 grams (17 Ounces) and is 40cm (15.7inches) in length in the closed position. When extended it reaches 58cm (23inches). Experts who have field tested the baton, especially liked the deterrent factors presented when the baton was opened and made ready. They also liked their two hands being protected behind the main shaft and housing reducing the likelihood of any impacts to the hands or knuckles. The recent increase in complaints and law suits against law enforcement personnel and institutions is a serious consideration that has been addressed in the design of the TSB 45. The TSB 45 is intended for defensive purposes but can easily be used as a deterrent or restraint device. 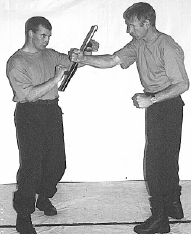 In addition it can be used to quickly and easily disarm someone with a striking weapon in their hand. From the drawing and making ready, to the on guard position, the TODD45 offers safety and a real deterrent. The TODD45's safe construction and robust materials combined with its practical application make unarmed attacks low risk. The TODD45 provides offensive actions that are effective and low risk reducing the likelyhood of law suits. Street weapon disarming made safer by the design of the TSB45 and its physical applications. The TSB45 offers evasive counter actions, targeting either the weapon holding limb or the weapon itself. 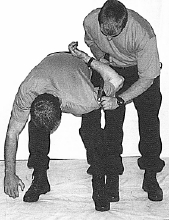 Control and restraint individual or team applications from a closed or open position provide universal applications. 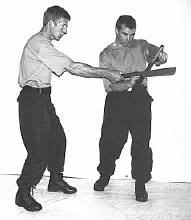 Looking for information on close combat training? 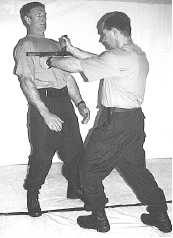 Read more about Todd Close Combat Systems in the Close Combat Files.